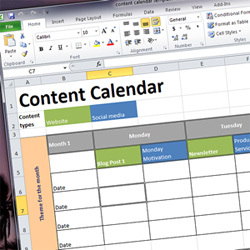 Automate your Social Media with a Content Calendar! You mentioned briefly during the last SEO training that content calendars can take a lot of the uncertainty out of social media by creating a master plan you could use on a daily basis. Are these good tools to use on a blog or with Twitter and Facebook? How do we get one setup? Answer: It's a well known fact that those who write down goals or daily activities, share that plan with friends, and then provide updates to promote accountability tend to be more successful in the long-term. This strategy is most commonly used to accomplish things like sticking with a weight loss or fitness routine, or meeting work deadlines. But the same logic can be applied to helping you run a successful social media content creation and promotional strategy. The daily mechanism by which companies and individuals accomplish this in the social media realm is called a content or editorial calendar. A content calendar is simply a daily schedule of when, where, and what kind of content will be published and promoted by you on the specific social media channels you control. The ability to plan-out weekly content creation around specific themes. Ensure resources are allocated to specific channels based on demand. Allow for the delegation of individuals to specific social media tasks. Establish a timeline for specific video, audio or graphical content creation. Enable companies to track past social media efforts and strategies and adjust future efforts. Encourage the production of higher-quality content and engagement vehicles. That's the why for content calendars. Let's talk about the how. SEN Forum Pick: Is SEO still affected if a blog is on the main domain versus a subdomain? How to Increase your Facebook Organic Reach: 7 Strategies that Work!